FMCG player Vi-John Group announced India’s first hair removal cream for men on 29th September. Vi-John is the world’s largest selling brand of shaving creams. It is India’s first FMCG giant to venture into the new category of men’s hair removal cream. The Vi-John Group is an internationally known company for its product quality and affordable prices. The Vi-John shaving cream is the world’s largest selling shaving cream. The new Masterstroke hair removal cream will give every man the opportunity for a smooth and seamless hair removal experience. The 3 variants – Masterstroke Argan Oil, Masterstroke Olive Oil, and Masterstroke Jojoba contain skin-repairing properties and have rich hydrating qualities for men’s thick skin. All 3 variants are available on e-commerce giants like Amazon, Flipkart, Snapdeal, PayTM Mall, Vi-John Kart , and others. The product is priced at Rs. 100 for each variant. 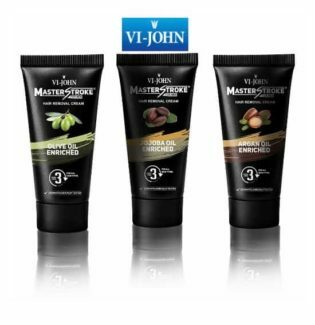 The Masterstroke is specially formulated for men’s coarse body hair and thick skin. The 3 variants are dermatologically tested to provide safe and smooth hair removal experience for men. Enriched with Aloe Vera extract, Masterstroke has properties that protect the skin from getting dehydrated and damaged. It has nourishing qualities that enhance the skin by giving it a natural boost. Jojoba acts as a natural skin conditioner. Argon oil hydrates and softens the skin, and Olive oil improves skin health to provide the ultimate look. The product’s 3-minute formula is quick and easy-to-use to give men a hassle-free experience and give the skin a natural glow. Late S. Suchet Singh established Vi-John in 1960. Since then, his vision has led to a tremendous growth for the company. The Vi-John Group is an internationally known company for its product quality and affordable prices. The Vi-John shaving cream is the world’s largest selling shaving cream; it is popular for giving users a smooth, soft and comfortable experience. Along with this, the Vi-John shaving foam has shown tremendous growth, with a month on month increase in market share. Feather Touch by Vi-John, a hair removal cream for women, is India’s second largest and most trusted hair removal cream. With its continuous innovation and product quality, the brand has shown an accelerated growth since its establishment, leading to its dominant presence in the market, making it one of the leading FMCG companies in India. For more information, please visit: http://www.vijohngroup.com/ .